As a user of the Elexoma Medic, this article, below, might interest you. It was recently published in the Richmark Sentinel. Though details of drugs and electrical current characteristics are not described, the electrode described here fits in with the use of microcurrent therapy. This is the first scientific validation I have seen for something I have observed a number of times with the Elexoma Medic: rapid nerve regrowth. If you know of anyone who has had a recent (or even not-so-recent) spinal injury, it may be worth their while to try out the Elexoma Medic for the condition. You will probably notice the reference to “implantable electrodes”. It is my opinion, based on personal clinical observations, that stimulation through the skin will be quite effective, too. Perhaps not quite as spectacular as the results described below, but compared to the cost of an implantation, the difference may not be that important. Pass me those sticky electrodes! Paralysed rats whose spinal cords had been severed from their brains were made to run again using a technique that scientists say can work for people, according to a study released Sunday. Consistent electrical stimulation and drugs enabled the rats to walk on their hind legs on a treadmill — bearing the full weight of the body –within a week of being paralysed. Remarkably, the animals could adjust their movements in response to stimuli despite the lack of signals to and from the brain: when the treadmill was reversed, for example, the rats walked backwards. “This means that the spinal network is almost capable of cognitive processing,” explained Gregoire Courtine, a professor at Zurich University. “It can understand that the external world is changing, and interpret this information to modify the way it activates muscle,” he told AFP by phone. 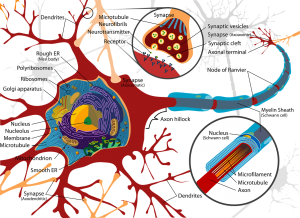 Earlier studies had shown that nerve networks in the spinal cord can produce limited motion in the muscles independent of the brain or sensory organs. But this is the first time that researchers have been able to restore normal or nearly normal functions. “We can optimise the use of the circuitry in the spinal cord to the point where the animals can sustain full weight-bearing locomotion,” said Courtine. “In some cases they actually walked with more consistent locomotive patterns than non-injured animals.” The next step is to develop devices that can be implanted inside the body. “We are now designing neuro-prostheses, arrays of electrodes that fit like a second skin between the vertebrae and the spinal cord,” Courtine explained. A strip measuring three centimetres (1.2 inches) long and one hundredth of a centimetre thick, the device is described as “minimally invasive” because it does not penetrate into the spinal cord. Courtine and colleagues are currently testing the neuro-prostheses on rats, and expect to have an interface for humans within four years. The new technique is designed to help patients with incomplete but severe injuries, such as those who cannot walk independently. “For these people, it is highly likely that this approach will improve their function,” he said. The mix of electrical stimulation and physical therapy may be enough to restore significant mobility in many patients, but the addition of drugs “would be extremely beneficial,” he added. In the rat experiments, the researchers injected so-called serotonergic agonists, a compound that mimics the effect of the neurotransmitter serotonin and activates receptors in the central and peripheral nervous system. There are approximately a quarter of a million persons with serious spinal cord injuries in the United States, according to the Foundation for Spinal Cord Injury, Prevention, Care and Cure. Other sources estimate the total worldwide at 2.5 million. Nearly half of all spinal cord injuries are caused by automobile accidents, and more than half occur among young people between 16 and 30 years old.